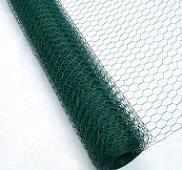 -- Hexagonal Wire Netting is popularly known as hexagonal mesh, rabbit netting and chicken wire. It is primarily manufactured in galvanized steel and stainless steel. The hexagonal wire netting is firm in structure and has flat surface. -- Characteristic by premium long lasting quality. Our netting wire is made using high quality marital which is galvanized inside and plastic vinyl outer coated to protect from corrosion and weathering, ensures longevity of the wire, which is ideal for making garden fences, chicken enclosure, livestock confinement, runs and cages for pets, lawn netting. -- Besides, this kind of netting are lightweight, sturdy and equally spaced to provide long-term use making them more cost-effective. Most importantly, it is simple and convenient to operate. Because it was designed with double direction hexagonal twist while staying flat and straight, it is easy to install and trim to your desired size for various applications. -- Whether you want to keep your garden flower bed, vegetable, grape vines, farm field and landscape safe from animals like cat, dog and pest, keep chickens from getting out or simply make a protective fence around the house, our netting is the best chioce.